When Columbus discovered the New World, he was searching for precious black pepper. But what he brought back to Europe were green peppers – long, spicy vegetables. These New World peppers quickly caught on in Europe and then spread to Africa and Asia. Today, hundreds of pepper varieties are grown worldwide. 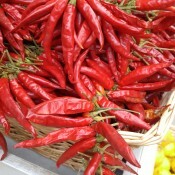 Some are sweet; the rest have pungent, spicy flavours – varying in degree from mild to extremely hot. The bell pepper is the sweetest and largest variety. They are typically sold green but are available in red, yellow, orange and even purple. The bright coloured ones have merely been allowed to ripen longer on the vine and are sweeter. As for hot chillies, there is no sure way to predict how hot it will be, but in general, the smaller varieties seem the hottest. The hot “oil” that is concentrated in the membrane of the inner skin of the chilli will burn, so don’t rub your eyes or skin before washing your hands. A pepper’s degree of hotness is rated in Scoville heat units. Mildly hot peppers have a low score; very hot peppers have a high score. 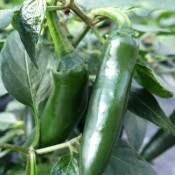 Peppers are a great crop for the gardener who is short on time. They have few problems and don’t demand daily harvesting, and when the growing conditions are right, they are bountiful. They are easy to grow and can be even grown in a large patio container. 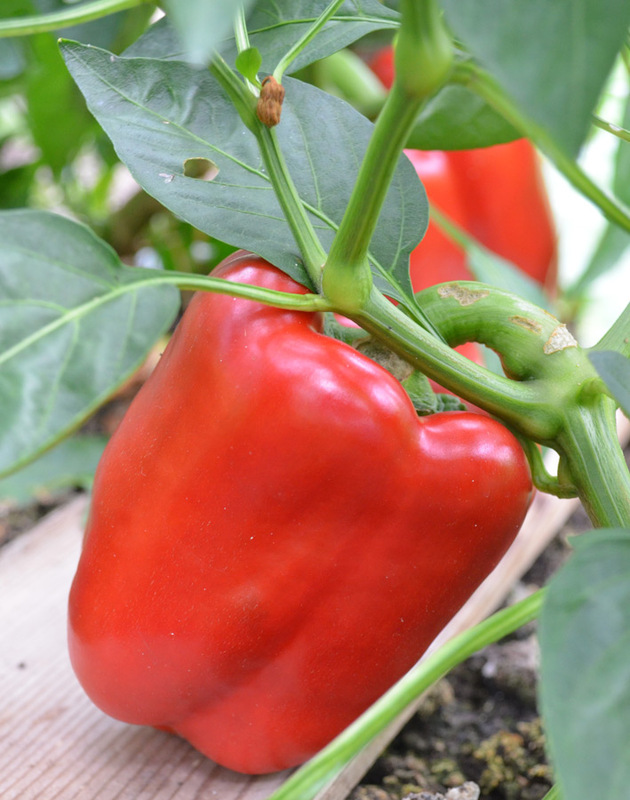 Peppers have a naturally upright growth habit, so they should be staked or supported. Use a sturdy stake or a mid-size tomato cage so the branches won’t break under the weight of the fruit. Pepper plants can suffer from water stress during dry periods. Best to use a drip-irrigation hose or water at the base of the plant as heavy watering from overhead can wash away pollen and reduce the fruit set. Peppers make good neighbours to asparagus, basil, cucumbers, eggplant, oregano, rosemary, squash, Swiss chard, and tomatoes. Do not plant peppers near beans, Brassicas(i.e. cabbage, kale, etc. ), or fennel. Rich source of Vitamins A, B and C. Peppers are low in calories-about 35 calories for a large raw green bell pepper, 30 calories for a green chili. 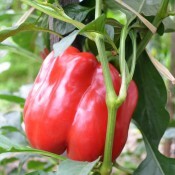 With bell peppers, leaving fruit on the plant suppresses further fruit production. So start the harvest early by picking some fruit while it is green. Continue picking as needed while the fruit change from green to their mature colour. Do not try to yank the fruit by hand because you will break off the branch. Cut peppers off the vine with pruners or a knife, leaving a little stem attached. As a precaution, wear gloves when harvesting hot peppers to protect you from the burning effects of capsaicin-the substance that gives hot peppers their heat. Unwashed peppers will keep in the refrigerator for up to two weeks. Peppers not eaten fresh can be dried, frozen or pickled. Thai Dragon is loaded with slender red and green peppers that are extremely flavourful and spicy! Attractive, container-friendly variety. 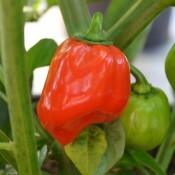 This dwarf hybrid produces a quality block shaped, 3 – 4 lobed sweet bell pepper that matures deep green to crimson red. The jumbo 5” (12cm) fruit has excellent yield potential. These mild peppers rate 0 Scoville heat units. Suitable for containers.